- It had been several years since I traveled the section of the Carrigain Notch Trail between the Signal Ridge Trail junction and the Nancy Pond Trail junction. I remeber it being a beautiful hike and there was one part I was looking forward to getting back to, a short section where the footing on the trail traveled over what could best be described as fish tank pebbles, thousands of thousands of little pebbles for maybe two tenths of a mile on the back side of Mount Carrigain below Carrigain Notch. - Unfortunately, tropical strom Irene had wiped out that pebble footing I remembered. It was still a nice hike, the pebble part is now just regular old dirt, but it was not as fun as I remembered it pre-Irene when I hiked it with Chris and Scott's during their 48 - 4,000 footer finish in 2010. - This approach to Carrigain is very quiet and remote, so if you are looking to avoid the crowds head over and down Carrigain Notch and then hook onto the Desolation Trail. From Desolation you will get a great workout as the trail rises steeply over extremely rough footing for the last three quarters of a mile below the summit. Also, be prepared to push through dozens of dozens of spider webs between Carrigain Notch and the Desolation Trail junction. Usually the spiders are tiny in size but every so often you'll come across a big, scary looking one. Before long you'll be wearing a spider sweater, not fun but it's all part of the wilderness experience! - Once on top of Mount Carrigain There were hoards of hikers. I took in the great views from the summit tower and then again along the Signal Ridge. I don't mind the crowds, I know how to escape them and most of them are extremely nice and happy to be hiking. I counted around three dozen on my way out, everyone was having a great time, and there were even a few friendly dogs out on the trail too. - As I descended I stayed on the three old sections of trail. The first one I reached was the top of the reroute around a beaver pond. What they did was move the Carrigain Notch Trail junction further down the old railroad grade about a quarter of a mile. The new trail bangs a left and heads around a beaver pond and then hooks into the original trail, I headed through the old trail at this point here and came out at the bottom where the old Carrigain Notch Trail used to split. This re-route I did once and will probably never do it again, not one of my favorites, so I stick to the old trail. The next reroute is a short section along Whiteface Brook, it's a little grown in and there's a washout into the brook, the old section avoids a tiny uphill switchback, it's a very short re-route. 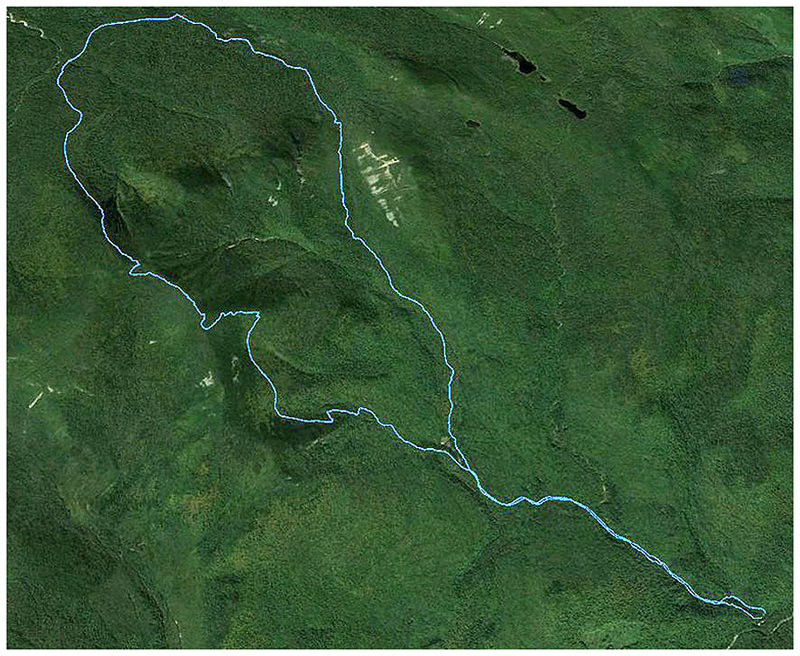 The third and final one was the original start of the trail and included a crossing of Whiteface Brook. It's still easy to follow, the brook became much wider at the crossing after Irene came through so I guess that was the reason for the re-route because the rest of the old trail is in excellent shape. - All in all it was a fun Saturday morning hike up one of my favorite Mountains. It also finished my August grid, the first month that I have ever gridded (Grid = hike all the 48 - 4,000 footer in every month). 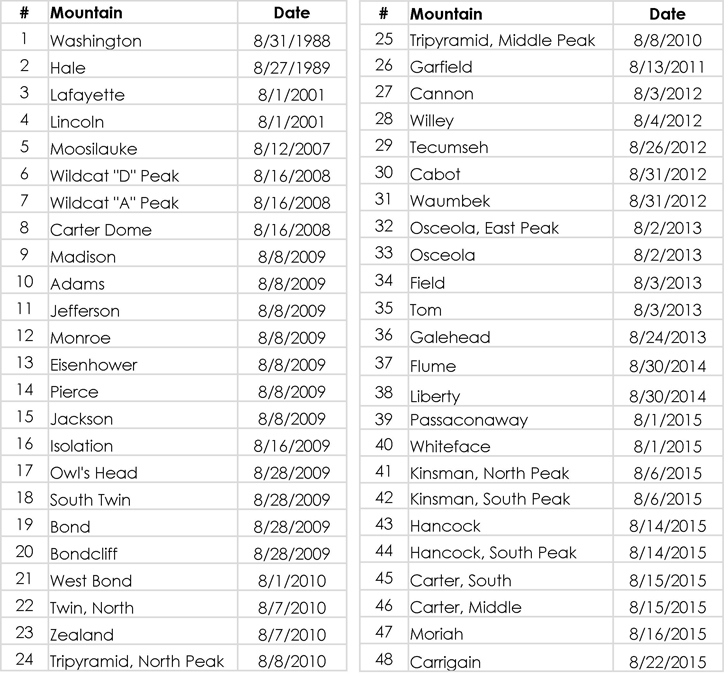 It only took twenty-seven years, Mount Washington August 31st, 1988 to August 22nd, 2015 Mount Carrigain! The second mile of the Desolation Trail is a steep, rocky, and root filled obstacle course! 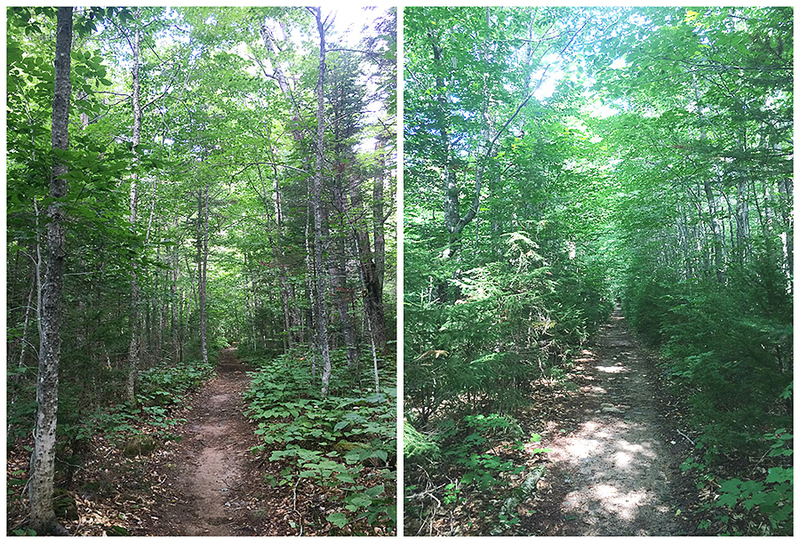 The second Signal Ridge Trail re-route. This one travels along the brook, there was a washout and it's started to be overtaken by plants. The first Signal ridge Trail re-route. It started from Sawyer River Road before the bridge, it travels over the Whiteface Brook. The new trail starts after the bridge on Sawyer River Road and avoids the water crossing. The old trail is still easy to follow. Signs and an old bottle of Tabasco Sauce! Great report and photos, thank you very much. Do you recall seeing any campsites?